To be readily available and provide Classic Volvo help to our customers and in this way give customer satisfaction and the best service that Gerry Lister can provide. To provide new and refurbished parts for the Classic Volvos, P1800 & 122 Series cars. To be available via phone, mobile and email to answer customer’s questions. To ensure our customers are 100% satisfied with our service by answering all queries as soon as is practical and to be available to show customers what the problems are on their Classic Volvo cars as well as advice on how to maintain their cars. To keep customers up to date on Volvo Events via our Facebook page and website. To provide service and parts to Australasia and all other countries. Volvo Downunder deals in NEW parts covering the years 1960 - 1975. 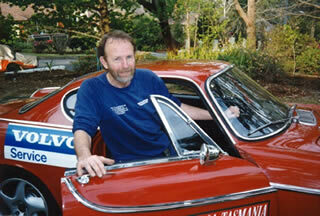 About us - in 2003 Gerry Lister commenced importing P1800 and 120 Series NEW Volvo parts to service Australasia. There was a growing need for easily accessed parts for Volvo enthusiasts to restore their vehicles. Gerry Lister joined the Motor Industry in Australia straight from School in 1956 "when you were taught to look after clients properly and give good service to those clients for as long as they owned their cars" - Gerry is always available for technical information and advice as a SPECIAL SERVICE TO OUR CLIENTS. He has a lot of experience and his availability to customers for help at any time has secured customer loyalty, some as long as 40 years. All NEW parts are sourced out of Sweden. The majority are genuine factory produced and the rest are high quality reproduction parts. We ONLY HAVE NEW PARTS FOR THE CLASSIC VOLVOS. The entire interior of the P1800S and 1800E is now available for those wishing to have their cars look as they were new. Genuine Dash Pads available for all 1800 Models and 123T. Gerry Lister in his Volvo P1800 which has seen many rallying miles and race days in Oran Park and Eastern Creek Raceway.